The common Snook is a species of marine fish in the family Centropomidae of the order Perciformes. This species is native to the coastal waters of the western Atlantic Ocean and the Caribbean Sea, from southern Florida and Texas. In Florida, they are by far the top inshore gamefish. It is a large, Pike-like fish with a protruding lower jaw and a prominent black lateral stripe that runs from just behind the gills to the tail. The Snook is overall a silvery-green color with fins that are sometimes bright yellow. The Snook is a sleek and extremely strong fish. They range in size up to 48″ and 50 pounds. The largest Snook ever caught in Florida USA weighed about 44 lbs. 11 ounces. It is is a powerful fish and thrilling catch, much like the freshwater Largemouth Bass. It is also an elusive and notoriously hard fish to catch. That is one of the reasons why it is one of the most sought-after and prized game. So, let’s learn more about this species and what we need to know to catch big some Snook. Snook are found in the Western Atlantic Ocean from South Carolina to Brazil. Snook are tolerant over a wide range of water salinity from freshwater to offshore saltwater. However, they are extremely sensitive to temperature changes, particularly cold weather. Water temperatures below 60 degrees F can cause the fish to go into shock or even die. In cold water areas, they can be found congregating in the warm water discharges of power plants. Snook normally tend to gather near bridge pilings, shorelines, inlets, and estuaries. They prefer structures for shelter such as mangroves, rock formations, and reefs. 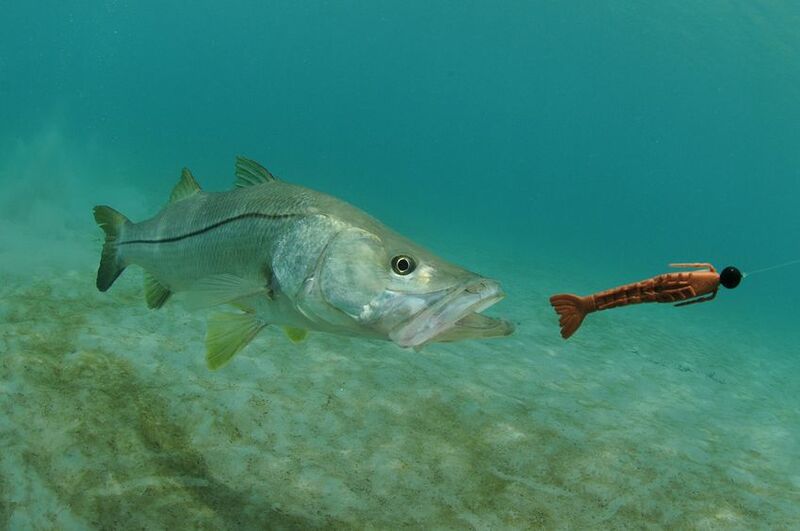 The majority of Snook caught by recreational fisherman are taken during the summer months. Some of the best Snook fishing in Florida occurs in places like Captiva and Sanibel islands and the Tampa Bay area on the west coast of Florida and Jupiter, Lake Worth, and Sebastian Inlet on the central east coast. Of course, everyone wants to know how to catch big snook; but taking the tides into consideration, understanding their habits and employing just a few tried and true techniques will definitely increase your chances. Also, keep in mind the season you are in and how the fish will behave. For example, the winter Snook with its slowed metabolism is not likely to be enticed as easily as in the spring when it begins to regain its appetite. But, of course, in reality, anytime you can get out on the water and fish for these prized game fish is a good time. Snook can be caught still-fishing, casting, drift fishing and trolling. Again, structure and covering cannot be over-emphasized when dealing with this shy and finicky species. Find structure and present your bait or lure of choice. Using an electronic fish attractor near structure is an effective way of luring otherwise reluctant Snook. Once the Snook has been located, fish live shrimp using a 10 to 20-pound medium to medium-heavy spinning gear with about 30″ of 40-pound shock leader tied to a 1/0 or 2/0 hook should do the trick. Weight the line with only enough split shot or sinker to get it to the bottom. A circle hook is also effective and poses less risk to the fish’s health once caught. Mullet, menhaden, pinfish, pilchard, etc. are the best-known baits for Snook fishing. In South Florida fisherman prefer live mullet whenever available – they’re like fish candy to the Snook. Again using the same outfit but using a larger hook to match the bait. When hungry and live offerings are scarce, they will also take cut natural baits. A wide variety of lures and jigs can be used to catch Snook. Some Snook angler favorites include the Spro Bucktail Jig and the Rapala Countdown Magnum. Topwater Poppers and swimming plugs will also work nicely with a slow, steady retrieve in inlets and around pilings. The fly fisherman might want to try large streamers. There’s little doubt that Snook is good to eat. Considered an excellent table fish, the common snook is fished commercially and raised in aquaculture in some parts of the world. They are not available for sale in the United States, however, so if you’re going to eat one in the U.S. you’ll have to catch you’re own legal size, in-season Snook. Its flesh is firm, chunky and white. It also very mild on the flavor scale as far as fish go and lends itself very well to many recipes. Delicious baked or on the grill as fillets, you can’t go wrong with Snook should you be lucky enough to get hold of one! Just remember, however, to be sure to remove all the skin from the fillet. Cooking Snook with its skin on can leave the fish with an unpleasant, soapy taste. Ask your fishing guide or fishing charter captain for their favorite Snook recipe – you won’t be disappointed. The Snook is the ultimate inshore game fish. Once hooked, its strength and speed are hard to compare to any other game fish of its size. I would be willing to wager that nine of ten slot-size, and bigger snook, are caught on the bottom. That’s where the big gals wanna be. And that’s where you need to be, presenting artificial lures and live bait alike, to bag that fish for the table or to catch and release a real whopper. Be sure to visit our fishing guide and charter page today to find the right professional for your next big Snook adventure and fishing trips throughout Florida, the Caribbean and Central America. This entry was posted in Fish Species, Saltwater Fishing and tagged are snook good to eat, snook fish taste, what does snook taste like on October 25, 2010 by Avid Angler.